How do I take great photos of my dog? If you’re a dog lover, the chances are you’ve spent many an evening trying to photograph your dog, attempting to get a picture that fully captures their personality. We’ve all tried, but all too often the dog refuses to play ball, or in some cases opts to ‘actually’ play ball when you’re trying to get their attention. They look away, run off and just won’t recreate the poses you know they’re capable of just because you’ve got your camera out. Help is at hand however from a new book, which comes out on November 1st, and offers invaluable tips on how to take great photos of your dog. 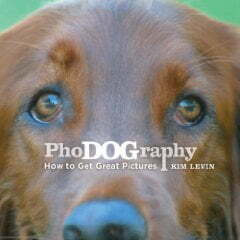 The book, PhoDOGraphy: How to Get Great Pictures of Your Dog, is available for pre-order from Amazon and features 144 pages of pictures and advice on taking better photos of your dog. It also offers tips on what angle to use, whether to use colour or black and white and various other tricks of the trade. If you’ve a new picture frame and don’t know which photo of your dog to put in it, don’t jump to any rash decisions before you’ve read the book and had a go at taking some new photos. These tips are excellent. My photography of my Westie, Mr. Henry, is very hit-or-miss, probably mostly miss! I’m definitely going to give it another go after reading this.